“Almost every other week, one of the station staff sees a tiger around here. Occasionally, a leopard. Elephants, well in summer, they cross near the home signal in hordes!” That was the station master at Dudhwa introducing his station to us. Not that we were expecting any less at a station located smack in the middle of a national park. I for one, was secretly hoping to come across one, even as we trekked in the dark towards the home semaphore. We didn’t come across anything bigger than a jungle cat, but then wild animals don’t turn up on a schedule. In these parts, even the trains were not running on schedule. A fact we that we learnt quickly, while chasing trains in the Terai. In the middle of the 18th century, the British cleared vast swathes of jungle and swamp around Bareilly and Pilibhit for logging and farming. Sal from central India became the timber of choice, while miles upon miles of farmland grew sugarcane. All this produce needed quick transportation and to this end, railway lines were laid in the last two decades of the 19th century. 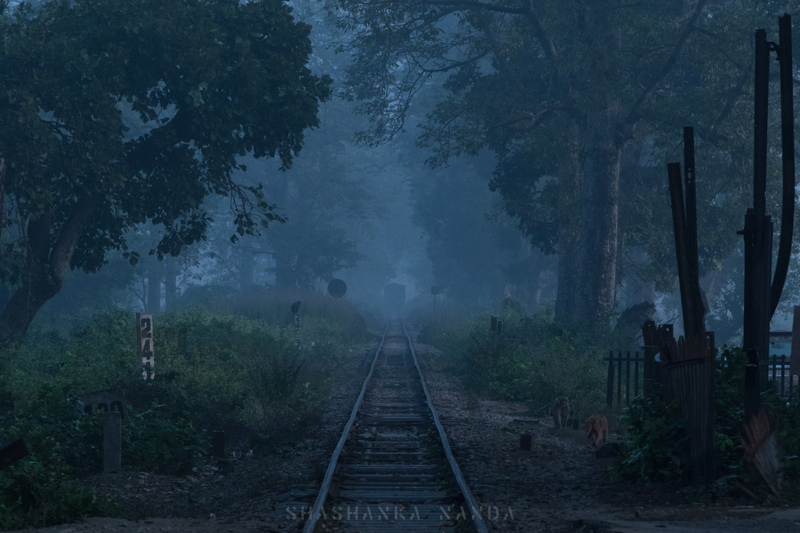 The Lucknow – Sitapur – Seramow Railway built the section up to Mailani, around the year 1887, while the Bareilly – Pilibheet Railway was built in 1884. The two railways were merged in 1891, to form the Lucknow – Bareilly State Railway. This system merged with the Oudh – Tirhoot Railway in 1943, and post-Independence, the sections became part of the North-Eastern Railway in 1952. They continue to be in NER at the fag end of their service. Large portions of the system have now been converted to Broad Gauge. Bareilly – Pilibhit, Sitapur – Aishbagh – Lucknow have all been widened. What remains is the 200 km odd Pilibhit – Mailani – Bahraich section, and a few short spurs radiating from Pilibhit and Mailani. 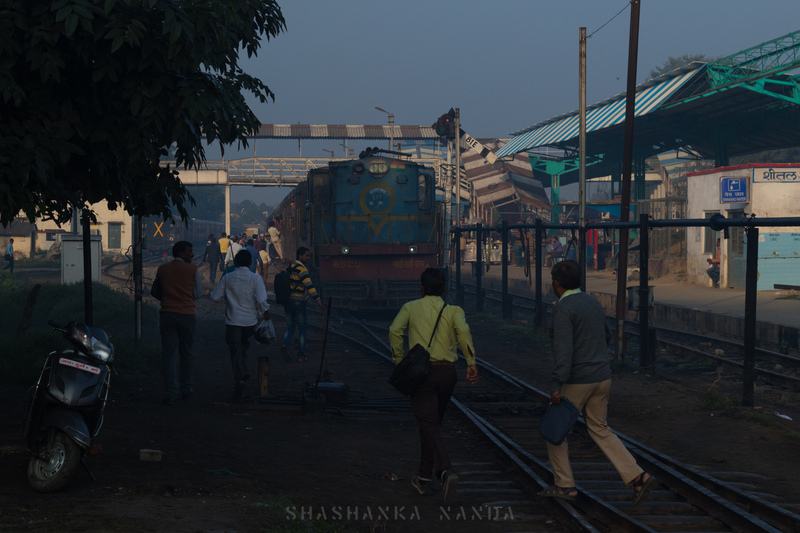 Commuters rush to catch the morning service to Mailani from Pilibhit Jn. The line from Pilibhit to Mailani, runs in a south easterly direction, passing mainly through farmland. A short stretch passes through an extension of the Pilibhit Tiger Reserve, near Mala. The proximity of farms with forest land has led to many skirmishes with wildlife. A tigress killed many humans in these parts recently. Needless to say, an encounter with wildlife at some of these remote stations was always on our mind. But more than the danger of wildlife, it was the fear of Meter Gauge being lost forever that worried us most. The sight at Mailani Jn. confirmed the worst. Lines and platforms were being uprooted to make way for Broad Gauge. Piles of rubble, mangled heaps of metal and the relentless drone of an excavator drove us away to the comfort of a signal box on the northern end of the yard where we awaited the arrival of a train from Pilibhit. A mid-day service from Pilibhit, arrives at Mailani Jn. Another arrival from Bahraich was expected, but was running late. 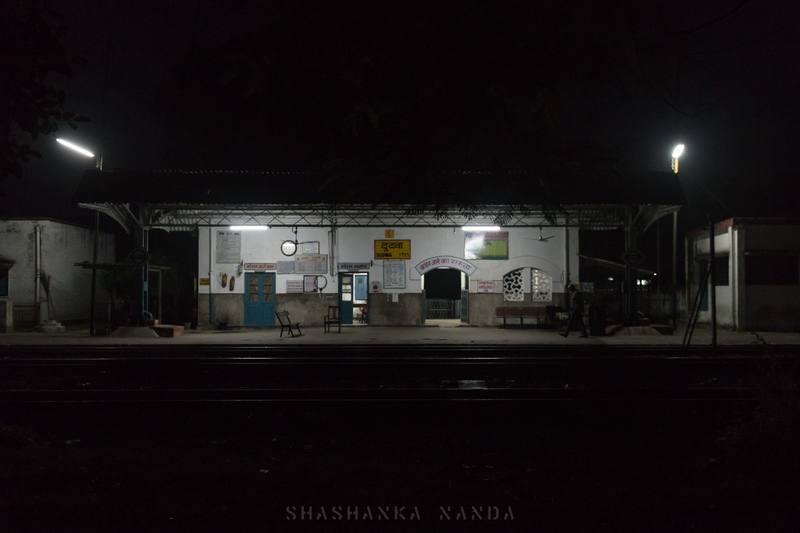 We hoped to catch it at Raj Narain Pur, an abandoned station a few kilometers from Mailani. It once served as a crossing station when passenger and freight traffic was high. But with the demise of the latter, maintaining the station was deemed a liability, and the building was left to the elements in 2013. The building is now a haven for insects, snakes, monkeys and the occasional tiger. 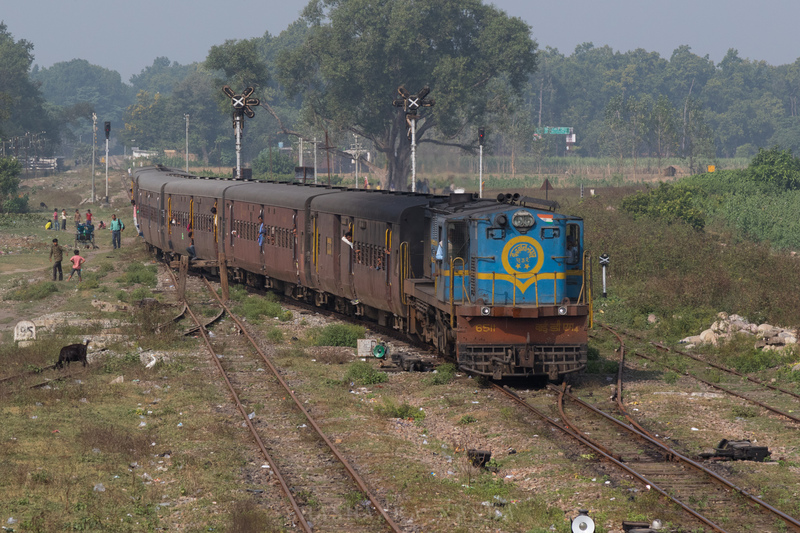 A Mailani bound service passes through the abandoned Raj Narain Pur station. 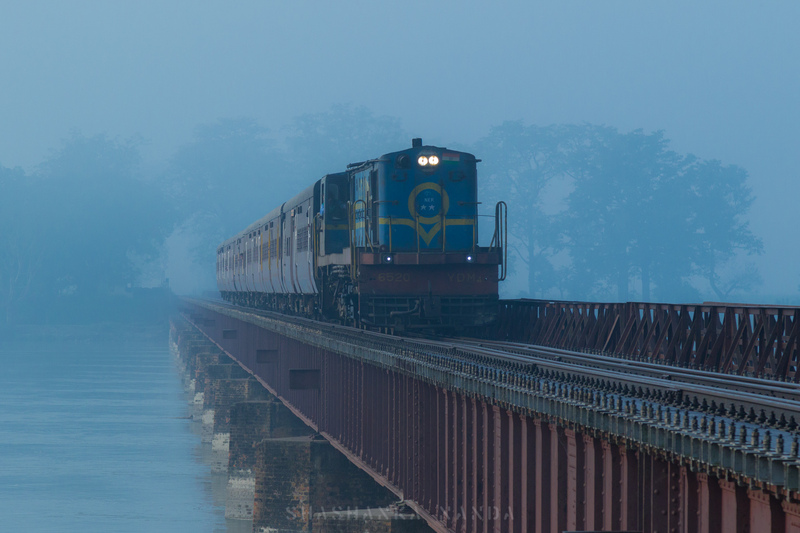 The line from Mailani to Bahraich crosses the Sharda river near Palia Kalan, before entering the Dudhwa National Park. The bridge used to be a common path for both road and rail, before a new road bridge was inaugurated later in 2013 to separate the two. The rail bridge deck was further revised to remove the road portion at grade. 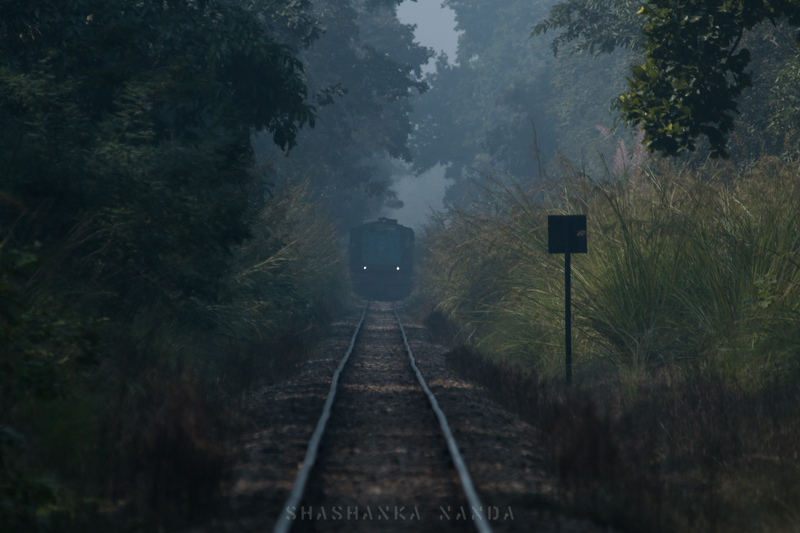 Travelling another 12 km north east, the line enters the Dudhwa National Park. The eponymous station serves as a crossing point for trains, and as a means of entry for tourists and staff serving both the railways and forest department. Two colonies housing railway and forest staff, flank the station. The station has a refreshment stall manned by a contractor who lives in Palia Kalan who wasn’t very happy with his returns. “I come in with the first train in the morning, and leave by the last train in the evening. Nowadays business is only with staff and the odd local person. 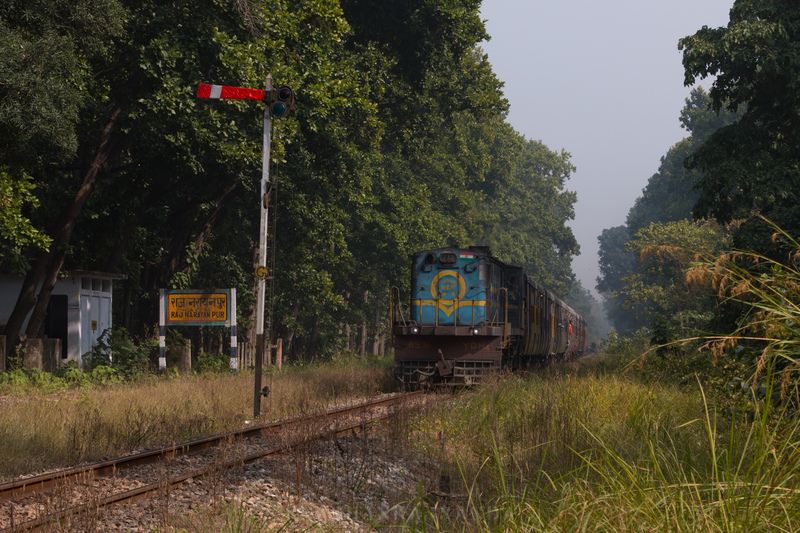 Tourists hardly come in by train.” With the breakup of the MG network, long distance connections to Dudhwa are virtually impossible, leaving road as the preferred mode of access. A village woman awaits the train at Dudhwa with her day’s collection of firewood. There was plenty of action that evening at Dudhwa, including a few crossings. Far away from the city lights, the early winter sky was crystal clear. 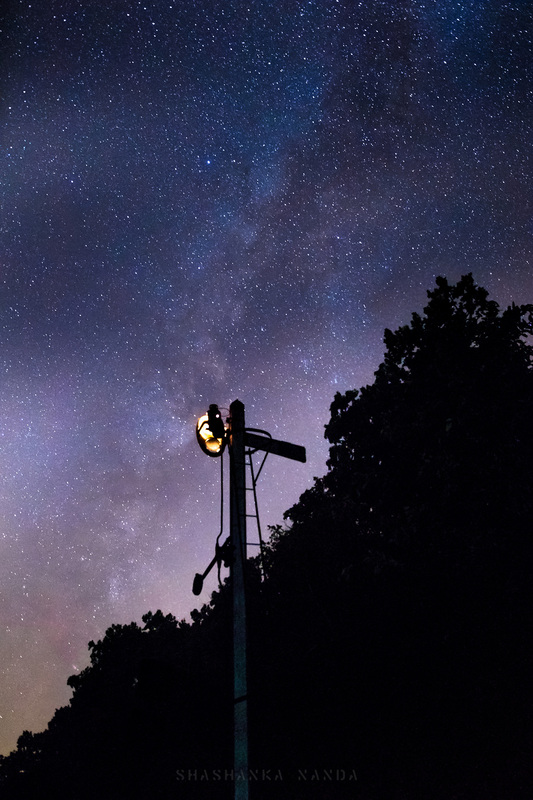 That allowed us to combine two passions – astro and rail photography. As we took leave from the station, a wild boar and a jackal crossed our path, reminding us who really was boss here. The lack of environmental clearances to build a broad-gauge line through the National Park will keep this section alive for a few more years. A tiny fragment of a system that once existed from the border with Burma to the one with Pakistan. Superb writeup and photos, particularly of the galaxy! With this kind of notes you make me travel into those unheard of places!Love your language!